Buried beneath the banks of the Danshui River in China, researchers have unearthed a treasure trove of 518 million-year-old early Cambrian fossils; the imprints of some of the earliest life forms — including more than 50 species previously unknown to science. The soft bodies pristinely preserved in ancient layers of mudstone provide new insight into the Cambrian Explosion, the little-understood evolutionary event at the dawn of complex animal life on Earth and the ecosystems and environments that hosted it. The discovery was published in the March 22 issue of Science. Like other widely studied Cambrian-age sites, such as the Burgess Shale in Canada and Chengjiang localities in China, the newly revealed Qingjiang fossils are characterized by exceptional preservation and high species diversity. However, what makes the Qingjiang fossil site unique is the unexpectedly large number of new species it contains. According to Dongjing Fu, a researcher at Northwest University in Xi'an, China and the study's lead author, and colleagues, the richness and quality demonstrated by the Qingjiang fossils suggests its potential to rival, if not surpass, all other early Cambrian sites in terms of species diversity. "Qingjiang is a new window on a different type of early Cambrian ecosystem," said Robert Gaines, a researcher at Pomona College and co-author of the study. "It includes some familiar players, but a very large number of new ones." Until the Cambrian Period, life on Earth was relatively simple. Single-celled bacteria, algae and other microbes ruled the day, plying the ocean surrounding the single supercontinent of Rodinia. However, a little more than 500 million years ago, something changed. Life on Earth exploded in diversity and form, and in a geological instant a number of new species flourished. The Cambrian explosion marked a profound change in the biodiversity of life on Earth and is responsible for grafting the initial branches of the tree of animal life that we're familiar with today. Much of what is known about the Cambrian Explosion has been learned at rare sites where the geological echoes of this early life have been well preserved. Of these, perhaps no other site has been more important to our understanding of the Cambrian explosion than the Burgess Shale locality. Discovered nearly a century ago, the animals of the Burgess Shale Lagerstätte (sedimentary deposits that contain extraordinary fossils with exceptional preservation) have in many ways become the archetype of Cambrian-age life. "Not only does Burgess Shale-type preservation reveal the details in the fireworks of our ancestors' big evolutionary burst, but it offers clues into a world that was very different than today's," said Gaines. To date, no other site except the Chengjiang Maotianshan Shales in China have matched the Burgess Shale fossils in total diversity and quality. Both sites contain well-preserved fossilized remains of soft-bodied organisms, which rarely make it into the fossil record, yet are crucial to understanding the scope of the Cambrian Explosion. "Like the Burgess Shale and Chengjiang deposits, the Qingjiang animals were engulfed by mudflows and rapidly buried in fine-grained sediments," a series of events which led to the exquisite preservation of creatures that usually leave no traces behind, said Gaines. According to the researchers, the fossils of Qingjiang exhibit near-pristine preservation and have not been altered by geological processes and weather, which has affected both the Burgess Shale and Chengjiang fossil assemblages respectively. As such, organic soft tissues of cnidarians, an abundant group of animals that includes corals, jellyfish and anemones, as well as other organisms with delicate body forms, are found in exceptional detail as striking dark-colored impressions in surrounding grey mudstone. At other Cambrian-age fossil localities, cnidarians are often underrepresented and demonstrate little diversity in species.The Qingjiang fossils contain a high abundance of the animals, making up nearly one-third of the species reported, the researchers say. These findings fill an important gap in understanding these creatures and their relationship to life's other earliest-diverging animal groups such as sponges and comb jellies. While the Qingjiang fossils are of the same age and located relatively close to the Chengjiang locality, there is little overlap in the species found at each site, which is especially surprising considering the Chengjiang is the most widely collected early Cambrian fossil deposit in the world, say the researchers. According to the study's results, only eight species are shared between the two contemporaneous sites. Furthermore, the most common species among the Chengjiang fossils are absent from the Qingjiang assemblage. "As paleontologists, we tend to think about the differences between Cambrian fossil deposits as a function of their relative ages; we are inclined to see the differences among them as representing an evolutionary sequence," said Gaines. "However, the Qingjiang biota dramatically upends this perspective." According to Gaines, the differences not only result from the biological evolution of species, but also from the local environments in which they live. The differences of the Chengjiang, as well as the high number of new species from the Qingjiang, suggest that the two sites represent different paleoenvironmental settings, with the Qingjiang fossils likely representing a slightly deeper marine habitat. 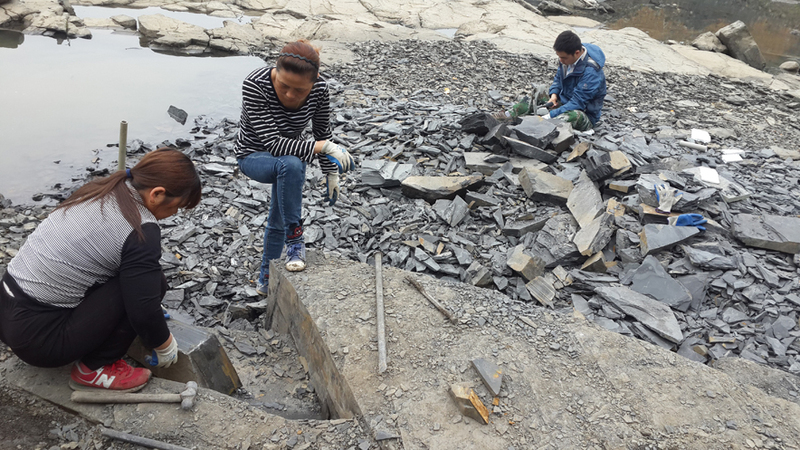 "[The Qingjiang] site is invaluable to Cambrian paleobiology because it will help untangle the signal of evolution across the Cambrian period from the ecological signal that governs the composition of any local ecosystem," said Gaines. Further exploration and comparison of these two sites allow for a rare opportunity to understand the environmental and ecological settings of the Cambrian Explosion. "By exploring the specific nature of the Cambrian oceans in which these ecosystems flourished, we can better understand the Cambrian world and perhaps the circumstances that triggered the Cambrian explosion," said Gaines.